The Three Stooges #1 1953 Saint John Edition - Choice of 2 covers - JUST IN! MyMovieMonsters.com > Comics - Archive Books > The Three Stooges > The Three Stooges #1 1953 Saint John Edition - Choice of 2 covers - JUST IN! American Mythology Productions presents The Three Stooges #1 1953 Saint John Edition. Choice of two covers! 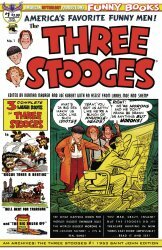 Remember when comics were a dime and you could get that first issue of Joe Kubert's and Norman Maurer's Three Stooges #1 from the local newsstand? We don't either! It costs a couple hundred bucks now to get that issue from an auction site, and it ain't fair! So, we are bringing back this classic from 1953 in all its original eye-poking glory for today's readers to enjoy. This is the first collaboration of The Stooges and the classic comics duo of Kubert and Maurer, and you can get it for 399 cents! - Limited-Edition B&W Photo Cover (this version has a higher cover price, and only 350 were produced). Important Note: You must choose your desired cover at the drop-down menu above. If you wish to collect more than one, return to this listing from the shopping cart. We also offer Monsters & Mayhem #1 and The Curse of FrankenStooge #1 in three different covers while supplies last.